What is your earliest memory about food? And what was the specific moment that made you realize you wanted to pursue a culinary career? I cooked a whole chicken by myself at about 10 years old. My mum is a great cook and we used to have a two-hour lunch break at home from school when I would watch cooking shows. I would watch and think, “I want to do that,” so I did. I love that you can get authentic versions of almost any cuisine. Japanese is proper Japanese food. Indian is proper Indian. You can get all of the ingredients to create versions of the dishes from our markets. Hoppers: I love the bone marrow varuval and any of the hoppers are excellent. The Clove Club: Every time I go I have an amazing time. I had razor clams steamed in pine needles once and that dish sticks to the memory. Quo Vadis: Pan-fried sweetbreads with almonds. I think they’re the best I’ve had. Elystan Street: Oh my god, it was unbelievable. Philip Howard can cook. Roast grouse with celeriac and pear puree and elderberry, fig and almond tart. Kiln: The lamb skewers with cumin are a taste sensation, as well as the fresh langoustines. Soho because it’s crazy, trendy, diverse, and fun. The three Barrafina restaurants are consistently ranked as some of the best–if not the best–restaurants in London. What do you think it is about your restaurants that make them stand out in the city’s dining scene? We work really, really hard and put loads of effort into getting the freshest ingredients possible, some of which we had to try very hard to find. It’s very important for all of us to respect produce, so we like to prepare fish dishes from whole fish and meat from whole cuts. We then cook everything in front of the guests, so they get a bit of theater as they see dishes made from scratch, and it enhances their dining experience. If you had to name one personal favorite dish from any of the Barrafina restaurants, which would it be and why? I hate this question because it changes with the seasons. 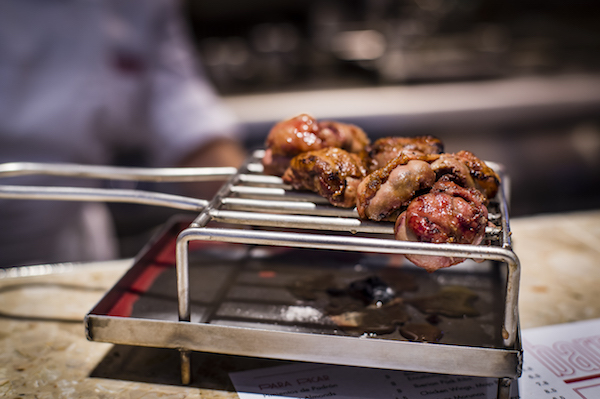 I do love the charcoal grilled milk-fed lamb’s kidneys that arrive sizzling on a griddle. Charcoal grilled milk-fed lamb’s kidneys from Barrafina Adelaide. Photo credit: Paul Winch-Furness. Breakfast: I’d just go for a coffee at Bar Termini. Lunch: HKK. Sunday lunch is perfect, great dim sum and really good duck. Dinner: Ledbury for the whole works. Snacks: St. John’s doughnut, chocolate or custard, then drinks at The Shard; the view is insane. Since it’s London, we have to ask: where do you go for the best Sunday roast, and what makes it so good? Quality Chop House. Shaun Searley can cook. What dish is your guilty pleasure and where do you go in London to get it? What makes it so good? I love a MEATliquor green chili cheeseburger and I don’t feel guilty about that pleasure. BAO for a quick bite of everything and chicken wings. Since Eats Abroad is geared toward travelers, are there any favorite restaurants or bars at any of London’s airports or hotels that you particularly enjoy visiting? Oysters and champagne at Gatwick. Are there any snacks or foods native to London that you particularly like and that visitors should try to seek out while there? Smoked eel sandwich at Quo Vadis. All the three Barrafinas obviously! And then walk down Waterloo Bridge at night and see how beautiful London is. Barrafina, 26-27 Dean Street (Soho); Spanish, lunch and dinner daily. Second location: 10 Adelaide Street (Covent Garden); lunch and dinner daily. Third location: 43 Drury Lane (Covent Garden); lunch and dinner daily. Hoppers, 49 Frith Street (Soho); Sri Lankan, lunch and dinner Monday-Saturday, closed Sunday. Elystan Street, 43 Elystan Street (Chelsea); modern British, lunch and dinner daily. Kiln, 58 Brewer Street (Soho); Thai, lunch and dinner daily. Bar Termini, 7 Old Compton Street (Soho); coffee shop and bar, open daily. HKK, 88 Worship Street (Shoreditch); modern Cantonese, lunch and dinner Monday-Saturday, closed Sunday. The Ledbury, 127 Ledbury Road (Notting Hill); modern British, lunch Wednesday-Sunday, dinner daily. The Shard, 32 London Bridge Street (Southwark); multiple bars and restaurants. Quality Chop House, 88-94 Farringdon Road (Clerkenwell); British, lunch daily, dinner Monday-Saturday. MEATliquor, 74 Welbeck Street (Marylebone); burgers, lunch and dinner daily. Second location: 133b Upper Street (Islington); lunch and dinner daily. About the Chef: You could say that Nieves Barragán Mohacho was less than impressed with London’s dining scene when she moved from Spain almost 20 years ago. Fortunately for Barragán Mohacho, things changed drastically over the past few years (“I can get sea anemones!”) and she has dozens of suppliers on hand to provide the highest quality ingredients for her three acclaimed Barrafina restaurants. She opened the first one in 2007, and 10 years later, Barrafina continues to collect accolades, even being named the UK’s best restaurant in 2015. These restaurants helped introduce Londoners to authentic Spanish cooking. Barragán Mohacho, who had previously worked at tapas bars in Spain, devised unique menus for each location, offering diners distinct experiences at each eatery.